It has been said a win is a win is a win. And while the Tampa Bay Rays 10-5 victory over the White Sox wasn’t pretty, that they were able to put another tally in the win column is all that matters. The Rays, now 9-3 on the season, have won four consecutive series and have built a six-game cushion in the W/L columns. For the fifth consecutive game, Tampa Bay took the lead in the opening inning. This time around Austin Meadows singled to right off Ervin Santana, swiped second, moved up to third on Tommy Pham’s fly-ball out to right-center, then scored on Brandon Lowe’s sacrifice fly to center field. The team tacked on three more runs in the second inning, starting with Avisail Garcia’s solo homer to center off Santana. It was Garcia’s third career home run off Santana and his first as a Ray. Then with two outs, Willy Adames worked a free pass before Meadows homered to right-center, capping the rally. Austin Meadows adds to the @RaysBaseball lead with a 2-run blast in the second inning! It was Meadows’ third homer this year. The Rays scored again the next inning, when Brandon Lowe belted a homer to left center, for a 5-0 advantage. The Rays weren’t done at the plate. They added a pair of runs in the fourth, chasing Santana when Michael Perez and Adames went back-to-back with one-out doubles. Finally, with two on, Meadows hit an RBI single to right-center — the seventh, and final, run charged to Santana. On the other side of the plate, Morton gave up a two-run shot to Yoan Moncada in the bottom of the third inning, although he otherwise kept the White Sox off balance by leaning on his fastball (both two and four-seam, 46 thrown, 29 strikes, 63% strike rate), curveball (30 thrown, 15 strikes, 50% strike rate), and his cutter (14 thrown, 11 strikes, 79% strike rate). Kevin Cash handed the ball over to Wilmer Font, who was charged with two runs (after he left the game) across 2-2/3 innings of work. The right-hander threw 57 pitches (36 strikes, 63% strike rate) and averaged 94 mph with his four-seam fastball, which hit 97 mph. Up until his final inning of work, Font showed signs of improvement, much like when he came over from Oakland last season. (Font) did a good job. He really picked us up. It’s good to see him get out there and get his pitch count, I think he got close to mid-50s, maybe a tick higher than what we would like, but the velo was good. We needed to get to the end of the game and he got us pretty close. While Tampa Bay scored a run on a wild pitch in the top of the eighth, things got messy in the bottom of the frame. After Font was pulled from the game with two outs and a pair of runners on base, Ryne Stanek, the third hurler of the day couldn’t retire a batter. The right-hander allowed an RBI single to right to Tim Anderson, then walked Welington Castillo, loading the bases. Eloy Jimenez followed with a slow roller past Stanek for an infield hit to draw Chicago within four. It made for an odd play, as Lowe and Adames collided as they attempted to field the ball. Cash then called upon Jose Alvarado, who became the third pitcher of the inning. The typically dependable Alvarado walked pinch-hitter Jose Rondon on a full-count pitch to force home a run. Pinch-hitter Adam Engel, representing the go-ahead run at the plate, worked the count full then swung at what would have been ball four, ending the inning. #Rays gave up 3 runs in the eighth. But Jose Alvarado Ks Engel with this 99 mph sinker to get out of the inning. Feeling the air escaping from the stadium, Tampa Bay bounced back to score two more insurance runs in the ninth when Kevin Kiermaier singled home Lowe, then Meadows walked with the bases loaded to force home the tenth and final run. Adam Kolarek took over in the ninth inning and put together a quiet frame. All told, Rays batter collected a total of 13 hits and eight walks, while every starting position player reached base at least once. A win is a win is a win indeed. The Rays and White Sox are slated to play the final game of the series on Wednesday, weather permitting. Tyler Glasnow (2-0, 0.82 ERA) will start opposite fellow righty Reynaldo Lopez (0-1, 10.00 ERA). Tyler Glasnow went to work in the bottom of the first, against San Francisco, with a plate appearance by the former face of the franchise, Evan Longoria, looming. The right-hander quickly disposed of the first two batters on five pitches, bringing Longoria to the plate. Glasnow promptly got ahead in the count before he spotted up a well-placed curveball on the inner third of the plate, locking up Longoria. The first at-bat against the former face of the franchise culminated in a punch out, as the 1-2-3 first set the tone for the afternoon against the tall right-hander. All told, Glasnow scattered three singles and allowed a walk, while striking out six. He threw first-pitch strikes to 17 of 23 batters (74% first-pitch strike rate), and 59 of 82 pitches overall for strikes (72% strike rate). On Monday, Blake Snell threw six impressive innings en route to the Tampa Bay Rays eighth win of the season, 5-1, on the south side of Chicago. 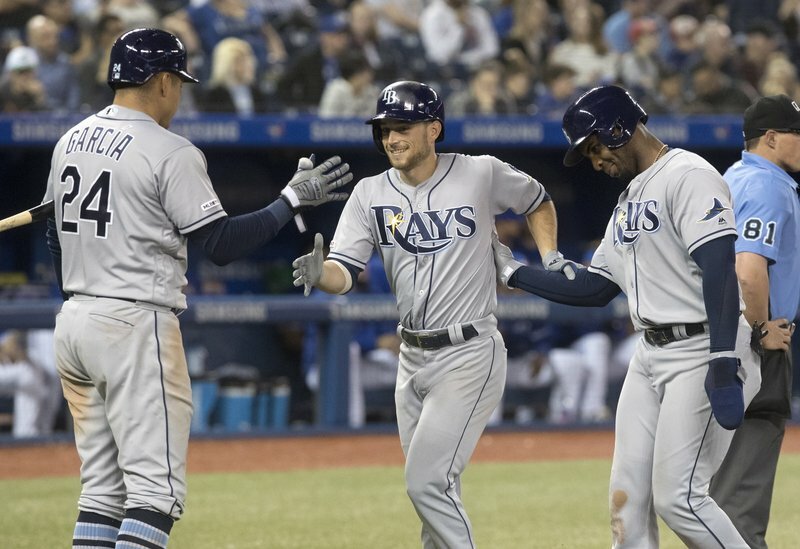 The Rays bats swarmed early, scoring two runs in each of the first two innings against right-hander Carlos Rodon, who previously allowed just two earned runs total in his first two starts. In the first inning, Yandy Diaz singled to right-field, Tommy Pham walked — extending his on-base streak to 43 games — and Daniel Robertson hit a single to right, loading the bases. After Avisail Garcia went down swinging on a 93 mph fastball on the inside corner, Guillermo Heredia walked, forcing home the game’s first run. Ji-Man Choi followed with a sacrifice-fly that Adam Engel ran down in left-center, preventing an extra-base hit. Then in the second inning, Willy Adames led off with a double to left-field before he was wild-pitched into third base. Pham walked for the second time in as many innings, and Robertson followed with a perfectly executed safety squeeze bunt for an RBI hit, extending the lead and moving Pham up 90 feet. After Robertson and Pham swiped second and third (respectively), the Pham came home on a Garcia’s RBI base hit for a four-run advantage. Yet while Tampa Bay had chances to add on more, the team left a lot of chicken on the bone — stranding 13 men on base (.188 BA wRISP), despite collecting 11 hits and eight walks. Suffice it to say, it made for a frustrating 5-1 win. Be that as it may, the Rays were able to tack on one last run against reliever Carson Fulmer in the eighth inning on a bases-loaded walk to Austin Meadows, capping the scoring. On the bright side, they have scored four or more runs in five of their last seven games — inching their runs per game (RPG) average up to four after starting the season with 2.75. Snell allowed just a single run on six hits across the first six frames. He didn’t walk a batter and struck out 11. Hunter Wood, who was recalled from Durham, followed Snell and threw three scoreless innings, for his first big league save. Wood struck out three, allowing just three hits. It was awesome. I was grateful to get the opportunity to go in, and kind of hopefully prove myself. I want to be here and I want to help this team out any way I can. … I know the bullpen was kind of running low so it was really big to step up and save the bullpen for a day. The Rays look to win their fourth series in a row on Tuesday afternoon with Charlie Morton (1-0, 1.64 ERA) on the mound. He’ll pitch opposite of Ervin Santana (2018, 0-1, 8.03 ERA). Charlie Morton is looking for his third consecutive quality start as a member of the Rays. In two starts this season, the right-hander has struck out 14 batters across 11 innings and has a 1.64 ERA. In two career outings against the White Sox (totaling 12-2/3 innings of work), Morton has been good, going 2-0 with a respectable 3.55 ERA. — Willy Adames collected three hits and is 6-for-11 since his 1-for-27 start. Yandy Diaz has hits in nine of his 10 games played. — Rays manager Kevin Cash said both Brandon Lowe, who tweaked an ankle running the bases, and Yandy Diaz, who hit his head diving back into second, were fine. — According to Marc Topkin (Tampa Bay Times) … Tommy Pham walked in the first inning to extend his team-record streak of reaching base to 43 games, crossing the halfway point to Ted Williams’ 1949 record of 84. — Tampa Bay has given up two runs or fewer in nine of the team’s 11 games, and have allowed just 20 runs total. Yet, of the 20 runs, 11 have come via the long ball. The bullpen overall has allowed just 10 runs across 44 innings.